"Stations Of The Crass was recorded with the intention of releasing it with Pete Stennett's Small Wonder Records; assuming - however that eventually Crass would have left Small Wonder to derive greater freedom..."
"If you look at the alternative charts at the moment you'll see we have about three or four Crass Records in it, and that as more than any other label has done at one time. We are a really viable threat: there are vague rumours of people wanting to buy Crass Records or trying to sign us up. By the end of the year when we've got another six records out they're gonna start worrying and see it really can be done." Penny explained how they got bands for the label "through buzzes. People mentioned bands, and after I'd heard a name three or four times we'd make contact with them. Anthrax and DIRT came like that. Also, bands came out of Crass' own following: for instance, the people in Conflict used to be in Crass' audience from the beginning." Anthrax were not the speed metal band so popular today, and on a similar note The Hit Parade - on Crass - was the alias for an Irish guy making records, commenting on Irish politics rather than the outfit featuring Cath Carroll, ex NME, or the indie-pop band singing about Gunnersbury Park. "The idea was to allow successful Crass label bands to set up a separate deal with John Loder (part of the Southern Studios set up and engineer on many Crass releases), under Crass' guidance. "Corpus Christi enabled bands to speak out in other directions such as when Crass disagreed with Conflict on their interpretation of sexism: almost a reversal of the usual attitudes of men towards women. "The recent re-release of some old Conflict material (CHRIST IT'S 16) was negotiated quite separately from Crass in a deal between John and Colin, of Conflict." Thus future Corpus Christi records should not be ruled out, entirely. Most of the Corpus Christi bands had filtered through Crass, although UK Decay who John Loder had worked with on their For Madmen Only, Fresh Records LP release had not, nor had Icons Of Filth, Blackpool band The Fits or San Franciscans Crucifix. Bands such as Conflict made their first LP of many for Corpus Christi; and the label also saw Annie Anxiety, (with On-U Sound producer Adrian Sherwoood at the controls), Rudimentary Peni, Omega Tribe, Alternative and Lack Of Knowledge moving into the long playing market. When looking at any label you find yourself branching out into other areas, and with Crass Records there is a very definite link with the current One Little Indian label. The origins of One Little Indian can be traced to Flux Of Pink Indians who in 1981 released the Neu Smell EP on Crass Records, then went to set up their own Spiderleg Records putting out not only future Flux Of Pink Indians releases but also their previous Epileptics recordings as well as debut work by the very prolific Subhumanz. 1987 saw the first One Little Indian release, the full length Adrian Sherwood produced, tribally slanted Uncarved Block by the shorter named Flux outfit: a classic record to launch a label with. Included amongst the personnel were Tim Kelly and Lou Bell, previously part of the Crass Records band DIRT. Other Crass Records artists who have since appeared on One Little Indian are Annie Anxiety, D&V, The Sugarcubes (the new incarnation of KUKL), as well as The Very Things and The Baby Men. As time went on The Cravats also recorded under the names of The Very Things; The Baby Men and DCL Locomotive all four bands featuring virtually the same personnel but having separate names for separate styles/ ideas; the whole organization being grouped under the Dada Cravat Laboratory (DCL) monker. An outfit called Hit The Roof emerged after the DCL's demise, and their record - a version of Edwin Starr's Contact - was also released by One Little Indian. 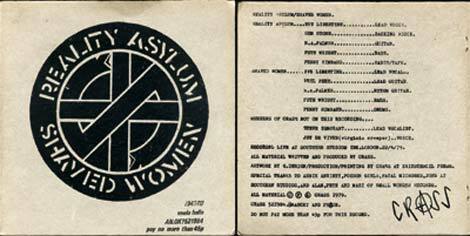 With regard to the other artists on Crass, Honey Bane made a radical departure from Crass to join EMI, Zounds joined Rough Trade - Crass Records' only serious competitor during the early 80s reign - to make a series of excellent singles and an album, The Mob joined All The Madmen Records and later evolved into punk-folkies Blyth Power, Poison Girls have released records on Illuminated and Rudimentary Peni made an H.P. Lovecraft inspired LP called Cacophony on their own Outer Himalayan Records in '89, but other than the One Little Indian / Crass artists the only band from that era still very active seems to be Conflict, although their own label - Mortarhate - is restricted to Conflict releases, rather than other bands now. No Class fanzine featured an interview in which Crass vocalist Steve Ignorant spoke about Grandmaster Flash's record The Message saying "We can't reach that black dancing audience, we'll never do it in a million years, but he can," but coincidentally there was very nearly a Crass record to capture that dance market, as Penny explains: "Take Your Elbows Off by Steve and Johnny was a 12" rap record by Steve Ignorant and Johnny Dynell - a New York DJ - but it only reached test pressings stage. It would've been a Crass Records release, but it didnt seem right at the time. It now seems quite seminal in the light off today's rap style records. Take Your Elbows Off was on both sides: one side was the Choral mix, the other side was the Orchestral mix. It was about classroom oppression; similar to Crass material lyrically, just as a lot of Crass stuff was in a very rap orientated style "
"Crass wanted to do a cross over single and the idea was to make a popular, classical record - which it isn't but it is nevertheless, very beautiful. "It was released through a new classical label connected through Pinnacle. It wasn't a Crass release as such and was underplayed by Crass as it wasn't within the context of what they were up to. There was a problem that as soon as Crass did something that sounded different people would think it was some kind of ploy." "The reason for releasing A Sides is that there's a lot of good material that people can't hear at the moment; and also...In the light of all these retrospective LPs of punk music we want to give a more honest picture of what punk was all about. Crass rarely get mentioned in connection with punk, although they often crop up in connection with Class War." "We deleted everything except our own material, on LP/12"; three years ago" although the D&V LP is still in stock as it never sold particularly well, and the KUKL LPs - which are also still available - would be repressed if there was a demand, as they sell due to the Sugarcubes connection. On Corpus Christi, the Conflict LP and compilation 12", two Rudimentary Peni LPs and the Crucifix LP are all still available.